I have been invited to present a day long course for the ‘Dawah Diploma’ in July 2013 – an intensive course on the intellectual defence and invitation to, Islam. Courtesy of Al Hikma. I will be teaching alongside my brothers in Islam, and colleagues in dawah, Dr Shabir Ally (Islamic Information and Dawah Centre), Shaykh Shady (Sydney Islamic College), Adnan Rashid (iERA) and Ather Khan (Zakir Naik’s IRF Dawah Team). Could the course also be online? I wonder if you could kindly clarify the credentials and academic status of the ‘Dawah Diploma accredited by the Islamic College of England (ICE)’ you are teaching in July? In my understanding a Diploma is equivalent to two years of an undergraduate degree and involves much intensive advanced study. The successful student is credited with a Diploma from a recognised academic institution of learning such as a public university. Could you clarify how this course leads to the award of a Diploma, and if the ICE is officially accredited to award such qualifications? If you could kindly read the title and text of the article, you may notice that quotation marks have been used to offset the term ‘Diploma’. Within this context, this would obviously denote in the english language that the offset term is what is known as a false title, and clearly not to be taken literally. The term ‘Diploma’ was used by the organisers presumably to encourage an earnest approach by candidates to the classes, and for its apparent alliterative quality in relation to the word ‘Dawah’. As for the course itself, we were led to believe it is merely a set of day-long dawah classes. If you have any questions regarding the course, it would be more appropriate to contact the organisers. If they prove unhelpful, then may we suggest you please contact our brother, Dr Shabir Ally, who has worked with IPCI for many years, and is also participating in the course, and may be able to illuminate you further as to his view of its merits. According to our understanding, we were invited to teach for one session of a multi-session dawah course, which we treat no differently to other invitations we have received for other courses run by other Muslim organisations. Please liaise with the organisers for further questions regarding the course. I did contact Dr Shabir Ally and he was not aware (till I told him) that he was participating in a Diploma course. I contacted the course organisers about my concerns but they have not replied. Paul Williams has been calling you ‘shameful’ for participating in this course that he considers to be a ‘fake diploma’, yet he cannot answer as to why Shabir Ally is not ‘shameful’ for doing exactly the same thing. I think he has something personal against you. I think his intolerant behaviour is a disgrace to those who do dawah. Unlike some recent fake courses endorsed by dawah organisations that should know better (see the Muslim Debate Initiative’s shameful participation in a fake “academic diploma” course), this is the real thing – taught by real scholars of classical Islam such as Shaykh Atabek Shukurov An-Nasafi…. I think singling out the Muslim Debate Initiative as shameful may be due to some personal issues you have with them. As your other article quotes of their reply to you, Shabir Ally doesn’t think it is shameful to participate in the course. Brother, I sincerely think you just need to stop attacking others please. my points are valid. Shabir Ally was not told the true nature of the course by the organisers – he did not know that the course was being promoted as an “academic diploma” course till I informed him of this. MDI apear to be quite complacent about all this and see no problem teaching on the “fake” course knowing full well it was not what it claims to be. See their website for the justification given. I think they want the ‘glory’ of participating in such a prestigious event even though it is a fake. Safz: do you think academic fraud (when perpetuated by Muslims) is acceptable? Are you seriously saying we should keep quite about it and not hold each other accountable? Why are you not speaking up about this? Why are you attacking me instead? 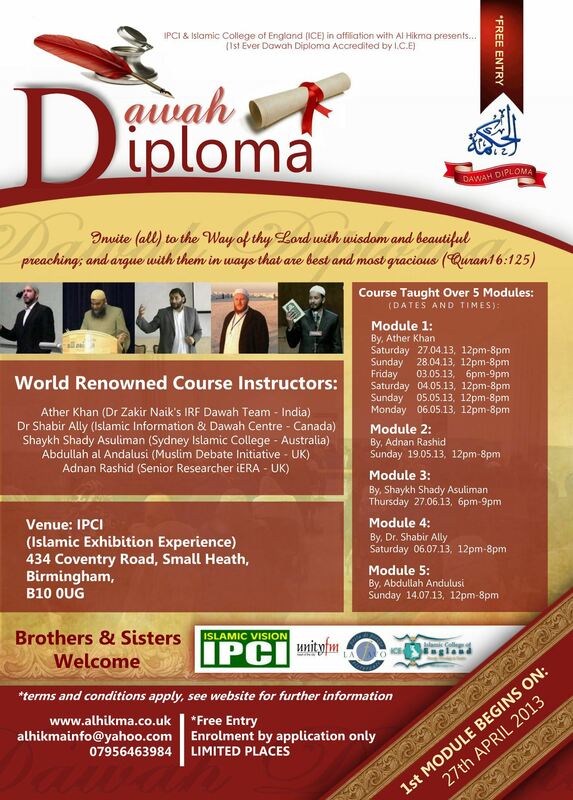 But my point being, Shabir Ally is still doing the ‘dawah diploma’ course, is he not? The site says he’s still scheduled to attend. Will you be holding him accountable too, in like manner like as you are the MDI? Apologies if I sound critical of you Paul, I like your work, but the MDI haven’t claimed this course is actually a diploma. They make clear it is just a dawah course. Why you so focused on them, and not the course organisers themselves? not so Safz – the publicity material on their website DOES clearly state it is an “academic diploma course”. MDI are knowingly participating in an academic fraud. You have not answer my question: do you think academic fraud (when perpetuated by Muslims) is acceptable? Paul, I respect you, but you are avoiding the fact that Shabir Ally is still participating in the course. Is he not also shameful as well? As far as I am aware, diplomas can be vocational, and the term academic can just apply to a serious classroom approach to a subject. Secondly, Al Hikma and the College do have qualified scholars that teach Islam. I think you’re being terribly unfair on all concerned. Is it because you had issues with them inviting Adnan Rashid? Where is the ”academic diploma course’ quote you mentioned? Ok, thanks for the link. But my point was, that MDI have not misrepresented the course. Anyone reading the MDI article would not think the course is anything other than a dawah course – like the ones that IPCI and WAMY do. I’m sure Shabir Ally also thinks the same, and will not be withdrawing from the course. “Anyone reading the MDI article would not think the course is anything other than a dawah course” but the course is not just a dawah course (MDIs view) but advertises itself as something much more academic and accredited than that. How MDI chooses to view the course does not have any bearing on how the course is in fact advertised by the organisers. It is academic fraud. I am surprised you are defending such deception. You presume to know about Shabir’s motives – have you contacted him about this? My view is that is certainly unwise for him to participate on the course as currently advertised. Why am I the only person to be discussing this? Ok, you have contacted Shabir and made him aware of your concerns, and yet he is still going to participate. Is that not as ‘shameful’ as MDI who are doing no different to Shabir? I don’t understand how there is fraud involved. Al Hikma are not charging anyone for the course, and they have said the course is accredited by an Islamic college (which has qualified Islamic scholars). They never said the college is accredited by the UK government. All these things are true are they not? Where is the fraud? Secondly, are you not too presuming to know MDI’s motives? They do a lot of events, and have done dawah courses for others presumably, so why would they (and Shabir) not do a dawah course for Al Hikma? It just seems you make excuses for Shabir or you have something personal against MDI, sorry to say that, but that’s what it appears. There is a charge for the course and i have already presented the evidence of its fraudulent claims. I have nothing further to add. ‘the course is FREE for all delegates, thereby removing the financial barrier between those who wish to strive for the sake of the deen. If we are going to hold people to account Paul, we have to be very careful to accurately portray the issue. The course is free, and Al Hikma gain nothing from the course. I fail to see how fraud is involved. It is a shame you have not admitted that perhaps you may have been a little harsh on Al Hikma. and others. They do much good for the community, and their dawah course is a great idea – something that Shabir Ally will not be ‘shameful’ for participating in. Those are good points Safz. But Dai’ee brothers are human too, and there maybe personal issues between them, lets not stir the pot. This Avicenna organisation looks amazing btw! In my understanding a Diploma here in the UK is a postgraduate degree lasting a least one year which involves much intensive advanced study. The successful student is credited with a Diploma from a recognised academic institution of learning, such as a university. …The publicly available publicity material does not suggest that it is “merely a set of day-long dawah classes”, but an advanced “academic” course resulting in an “accredited” qualification from the ‘Islamic College of England’. See the claims the course makes for itself here. Many Muslims have (rightly) taken ‘Dr.’ James White to task for the dubious nature of his doctorate. We should be equally rigorous in our own claims to academic accreditation. Otherwise – believe me – here in the UK we will be the laughingstock of the wider non-Muslim community. I’m not having a go at you Paul, this is just sincere advice. I’m just wondering why you are having a go at some Muslims for apparently being ‘shameful’ (in your words), yet you do not say the same for Shabir Ally for doing exactly the same? It does look like something personal, sorry to say. I don’t think many people question your motives, but they see you questioning everybody else (you said about MDI for example ‘I think they want the ‘glory’ of participating in such a prestigious event’). And though being the minority does not make you wrong, it does not make you right either. But the world does not revolve around your understanding, Paul. We all see things differently. Muslims are all free to disagree, but when you use the word ‘shameful’, it seems you are judging other Muslims with your own understanding, and not being very respectful. You can say that MDI and Shabir are not taking the wisest course of action in your opinion, but the word ‘shameful’ is harsh surely? Are you in the UK? Do you have any familarlity with the diploma system in this country? What are the facts? I have done some research into this and that is my understanding. Do you have a personal grudge against me? I have provided documentary evidence that MDI and others are particupating in a dodgy program that misleads a potentially credulous public. I am sincerely concerned about this. Your unhelpful and antagonistic comments might suggest to some that you an internet troll. I am not ‘having a go’ but raising legitimate concerns about fraudulent claims about a course. MDI have attemoted to justifiy there actuions using disingenuous and bizarre arguments. Shabir Ally has not done this. If MDI had shown a bit more honestly and openness I might have responded differently. The cases are different in some respects. Considering the Al Hikma course is on dawah (not Islamic Scholarship) and is accredited by an Islamic College with scholars that have Ijaz’a (qualification), why not call it a Diploma? I’m not a troll, but when I saw you use the word ‘shameful’ to describe Muslims who do good work, and want to help others, I had to raise these points. I hope I have not offended you. I thought that you would understand, as you always seem to encourage people to investigate matters or take people to task, or publicly account people. I’m not having a go at you, Paul. Why are you getting upset with me, I thought you welcomed such advice? Paul, MDI have claimed they do not consider the course to be an official diploma (or at least that’s what they appear to say). So they say they will consider it a normal dawah course. What is wrong with that? Since Shabir is going ahead with the course, after you have informed him about your concerns, does that mean that he has no justification? Or does he not also (along with MDI) consider the course to be a normal dawah course? It seems you are inventing extraordinary excuses to condemn MDI, and exempt brother Shabir. seems like when you run out of non-muslims to debate you move onto the muslims. you have far too much time on your hands. maybe you should write a book on the word diploma clearly its your specialist subject. obviouslyyou have a personal issue with one of the speakers or the organisation itself this whole diploma thing is a front. I would happy tell you what’s bothering me but this site is censuring my comments – and will not give me the right to reply.